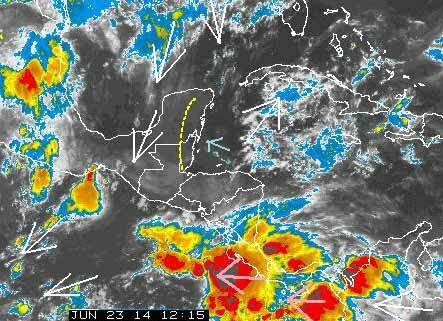 Belize NMS: Weak tropical wave will support gusty winds and an increase in moisture later today and tonight. 24-hour forecast: Mostly sunny with isolated showers or thunderstorms today becoming cloudy at times tonight and tomorrow morning. Sunny with cloudy periods later tomorrow. A few showers and isolated thunderstorms will occur mostly along coastal areas tonight and tomorrow morning then inland tomorrow afternoon. Today: Winds: E-SE 10-20 kts. With occnl higher gusts. ; seas: Moderate - rough. ; waves: 4-7 ft.; isolated showers or thunderstorms. Tomorrow: Winds: E-SE 10-20 kts with higher gusts. ; seas: Moderate - rough. ; waves: 4-7 ft.; some showers and a few thunderstorms. Marine Outlook: Tuesday night:- winds east 10-20 kts. and gusty. ; seas: Moderate - rough. ; waves: 4-7 ft.; some showers and a few thunderstorms. General Outlook: For Tuesday and Tuesday night is for cloudy skies with some showers and a few thunderstorms over most areas, especially over the south and along the coast. 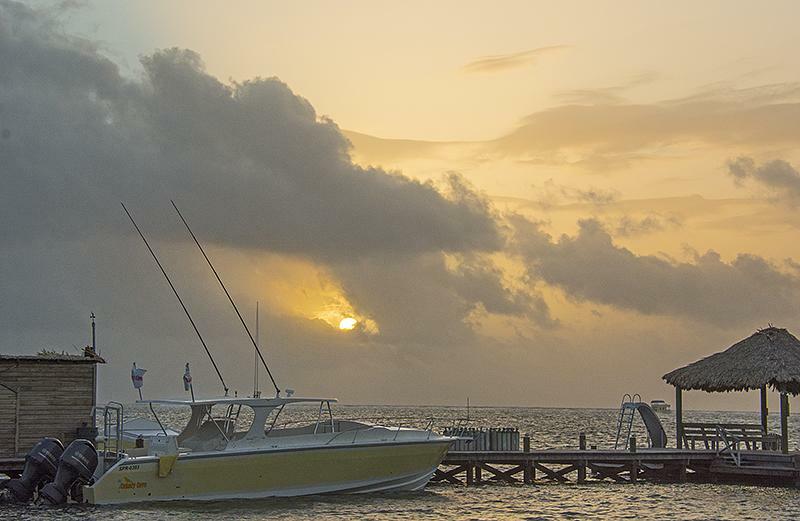 On Ambergris Caye this morning the sun is up on a nice lookin day. Our expected high is 88 and the breeze is ESE at 8 mph. Very few, small showers around this morning.. .The Cloud cover is generally thin.. . .Dry air from the North appears to be evaporating any rain clouds from the Caribbean.. .. .. Surface wind early this morning stationary, but ESE winds bringing the thin clouds over Belize.